How Far is Lancor Corner Stone? 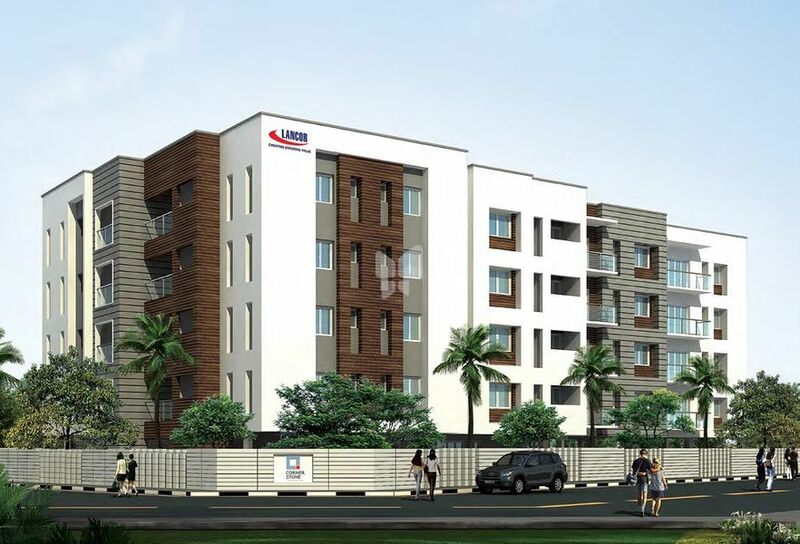 Lancor brings to you a new opportunity to own an apartment / flat at Nanganallur. CORNERSTONE offers exclusivity with Just 24 luxurious 2 & 3 bedroom homes Ranges from 1113 sq ft to1639 sq ft Each home / flat offers Pre fitted air conditioners 100 % power back up with all amenities & features. RCC framed structure with RC foundations conforming to BIS. Pre constructional anti termite treatment will be provided under foundation and the external perimeter of the building, as per BIS for the entire structure. 9” thick brick work (Fly ash / Earthen) for the outer wall 4 ½” thick brickwork (Fly ash / Earthern) wall for the internal partition wall. All brick work edges are protected with GI strips (as recommended by the architect) and plastered. Internal walls will be finished with cement plaster and Wall putty (JK or equivalent) with tractor emulsion or equivalent. The toilet walls will be finished with imported ceramic tiles from Spain of colour and size as recommended by the Architect up to the ceiling height. Trims and profiles in PVC will be used to protect the edges of the ceramic tile. Common areas will be finished with cement plaster and cement paint. Wash area will be finished with imported ceramic tiles up to ceiling height. Dado of 2’ above the kitchen platform will be finished with imported ceramic tiles of colours and suitable size as specified by the architect. Exterior faces of the building including the balconies will be finished with cement plaster and emulsion paint – Asian Paints (APEX) or equivalent. Textured finish will be given in certain areas as suggested by the architect. Ceiling areas of living, dining, bedrooms & Kitchen will be finished with Cement plaster & Wall putty (JK or equivalent) and painted with tractor emulsion. Ceiling areas of Toilets & other areas will be finished with cement plaster and cement paint. 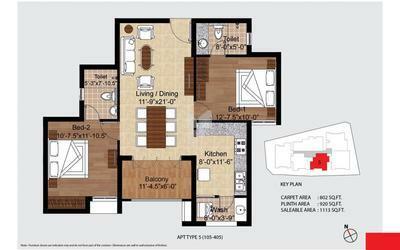 Living, Dining & Bed rooms will be finished with imported Vitrified tiles from Spain as prescribed by the Architect. Kitchen, Utility, Balcony & Toilets will be finished with imported ceramic tiles from Spain of suitable size as recommended by the Architect. 4” high skirting matching the floor tile will be provided wherever required. Car parks will be finished with Granolithic flooring and Driveways will be finished with cement tiles as recommended by our architect. MAIN DOOR SHUTTER (2100 x 1050mm) 45mm thick solid flex bound core, with teak veneer on both sides and solid teak wood edge lipping on all sides of the shutter and hinged to west African teak wood frame (100 x 45mm) with bottom threshold and with necessary architrave – finished with Polyurethane Lacquer Paint . Godrej ultra lock or equivalent make will be provided. TOILET DOOR SHUTTER (2100 x 750mm) 32mm thick with pre-calibrated high density molded Masonite skin on one side and plain suede finish HPL laminate on the other side with lipping on all sides of the shutter and hinged to Seasoned Solid beach wood frame (100 x 45mm) along with necessary architrave – finished with Polyurthene Lacquer Paint . Godrej Cylindrical locks or equivalent will be provided. WINDOWS: Imported Aluminum sliding windows will be provided in all rooms. FRENCH WINDOWS: Imported Aluminum Sliding Type French windows will be provided. Counter top Platform (dry fixing) will be finished with 18mm thick granite slabs 2’ wide at a height of 2’ 9” from the floor level and provided with Carysil / Stainless Steel One and a half Bowl sink. Sink mixer will be provided. Wash area will have Single bowl Carysil / Stainless steel sink and provision for fixing washing machine. Provision for fixing an Exhaust fan, Ceiling fan, Microwave, Fridge, Mixer, Grinder and Aqua guard will be made. All sanitary ware will be of Roca or equivalent make – ‘White’ Color. New range of wall hung closets Roca or equivalent will be provided in all toilets as decided by architect. All toilets will have the new range of Roca wash basins as decided by Architect. All CP fittings will be of Roca/ Parryware or equivalent make. Shower partitions using “Dorma” fittings or equivalent will be provided in Master and Children’s Toilet. Overhead shower with diverter and spout will be provided in all toilets. All toilets will have provision for connecting a Geyser, Exhaust fan. Concealed insulated copper multi-strand wires in all apartments. Each apartment will have to be provided with distribution board having MCBs. All switches and sockets are of MK or equivalent make. 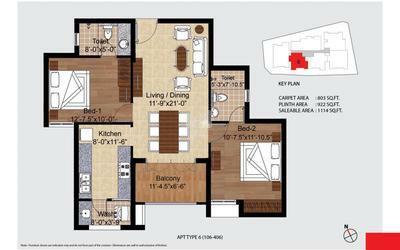 2 Pair telephone line points will be provided in living and all bedrooms. Empty conduits for TV points will be provided in Living and all bed rooms. Samsung / LG or equivalent brand of Split Air conditioners will be provided for Living and all Bedrooms. Building will be served by SIX passenger lifts of KONE or equivalent make with Automatic Openable Doors. 3 phase power supply with 100 % generator back up will be provided. 5’ high compound wall will be provided as specified by the Architect. The entire project will be magnificently landscaped. Adequate Bore wells will be provided. Underground RCC sump of adequate capacity for Bore well / Drinking / Treated Water, overhead tank with a partition wall for drinking / borewell water will be provided. Reverse Osmosis Plant will be provided to meet the drinking water requirement. Air-conditioned Gymnasium will be provided. CCTV, Access Control, Audio Intercom and Guard Tour System will be provided. Lancor Holdings Limited, a Public Limited company listed on the Bombay Stock Exchange, has been creating landmarks in Chennai for over 34 years. Some of its landmark developments in Chennai include The Atrium in Thiruvanmiyur, Westminster in R.K Salai, Abode Valley in Potheri, TCP Lakefront in Sholinganallur, Kiruba Cirrus in Valsaravakkam and Menon Eternity in Alwarpet. “The Highest Transparency Award” in 2009 and “The Highest Customer Protection Award” in 2010 from CNBC AWAAZ CRISIL. Lancor Lumina in Guduvanchery has been awarded “Best Gated Community Project” by Times of India in 2017 and “Lancor TCP Altura” in Sholinganallur has been awarded “Best Customer Centric Project” by Times of India in 2018.